Yes, I know I’m late to the game writing an article on this album, but I only got it at the weekend. Buy hey, better late than never, and this is an album, that after listening to a few times, I just absolutely had to write about. I got the Accelerated Deluxe version , though Amazon in the UK didn’t actually list another, normal version. I was drawn to Two Lanes of Freedom after recently seeing a few people mention that it was rockier than his normal material. Not having listened to any Tim McGraw previously I had nothing as a reference to what his usual sound is, but as someone who grew up loving 80s hair rock, anything labelled rockier is going to appeal to me. I have to admit, after the first few songs I had to wonder what the pace of his previous songs was, as this didn’t seem that rocky, well, apart from some pretty slick guitar solos. In fact, coming to think of it, those guitar solos, especially in Friend of a Friend and Southern Girl were reminiscent of the those I’d heard played by long haired spandex wearing bands 3 decades ago. That’s a good thing in case you were wondering. Though my own guitar playing has started but stumbled at the first hurdle many times, my appreciation for good axe handling is very high. Spoke to soon didn’t I, as the fifth song on the album, Truck yeah, certainly upped the rock stakes, with an intro that kind of reminded me of Insane Clown Posse’s Take It. To answer your question, I was a wrestling fan back in the day and that song was part of World Championship Wrestling, okay? Anyway, Truck Yeah – awesome! Every album, well most, need a song that you want to roll the windows down and crank up whilst driving along, and this is Two Lanes of Freedom’s. There are plenty of examples of reflection, melancholy and sentiment elsewhere on this album, this is an ar$e kicking anthem that could well be my new getting ready to go out song. We even get it again later on in the album in the form of a live version, complete with a testosterone pumping, engine revving intro – Truck Yeah! After that we go straight into a song called Nashville Without You which celebrates Nashville and all the talent that has made it so special. With a blog called 4000 Miles to Nashville I could hardly go without talking about such a song. Nobody is mentioned by name, but if you know your country music history, you know who is being referenced. The people alluded too are pretty mainstream, so you don’t need to be a Music City anorak to get them, after all, I did! So it was the rock reputation that got me interested, it was the rock solos and song that first caught my attention, but after a few listens it was the amazing storytelling that really made me sit up and take notice. Take for example Annie I Owe You A Dance – an absolutely beautiful song about a guy regretting not taking his girlfriend to the prom, but finally getting the dance he’d promised, in the supermarket. I really haven’t done it justice with that short description, but suffice to say, this is a song that almost brought me to tears whilst listening to it in my car on the way to work. This is listed as a bonus track and if that means the vanilla version never included this song, well, that’s an absolute travesty. Throw in the aforementioned Friend of a Friend and Number 37405 and you have three songs that tell as good a story as is possible in 3 – 4 minutes. How can a guy being locked up for killing someone whilst drink driving be good material for a song? You’d be forgiven for wondering that, but listening to Number 37405 and it all becomes clear, and is a song which is one of the highlights of an incredible album. This is a collection of songs that are so varied that there really is one for very occasion and mood. However they don’t feel out of place with each other, and I love the juxtaposition of going from Annie I Owe You A Dance to Mexicoma, which opens with the line I’m sittin’ here stoned, at Tortilla Jo’s and has a chorus I’ve been singing to myself all day. I haven’t even mentioned the best known song on Two Lanes of Freedom, which is a collaboration between Tim McGraw, Taylor Swift and Keith Urban. You may have heard of it, Highway Don’t Care? This is a song that sits a top a lot of people’s songs of 2013 and is the perfect melding of three very talented musicians. Tim and Taylor’s voices work in perfect contrast and you can say what you want about Taylor Swift, and much has been said, but the girl has a stupendous voice. Keith on guitar is a virtuoso and has me thinking an album of his should be my next country music purchase. The more I listen to this album the more I like it, to the point where I’m not sure where it will sit in my list of top albums of 2013 that I am currently working on. Could it really take away that top spot from an artist many would never think I would see usurped from number one? It’s Your World having an almost Steve Vai-esque solo in it could help, given that Mr Vai is somewhat of a guitar her of mine. 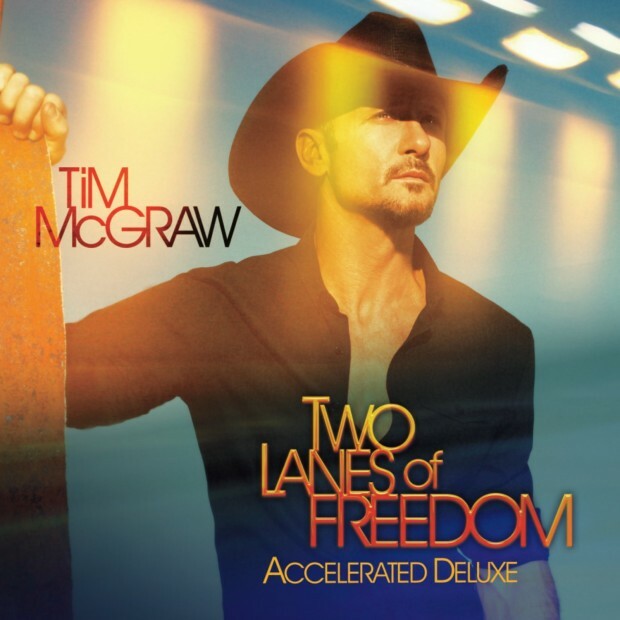 Two Lanes of Freedom is a superb album which demonstrates Tim’s skill as a singer, songwriter, musician and as someone who can give us a bunch of songs that showcase both his fun and sensitive sides in fabulous harmony. I’m sure I’m not the only one who after listening to Book of John will at least try to start keeping a physical record of experiences and memories. I honestly can’t recommend this album enough, and if you are one of the few, like myself, who didn’t buy it last year, then please get it now, as a matter of importance. I’m now off to listen again, for probably the eighth time in three days.